Hello and welcome to another edition of Mastication Monologues! 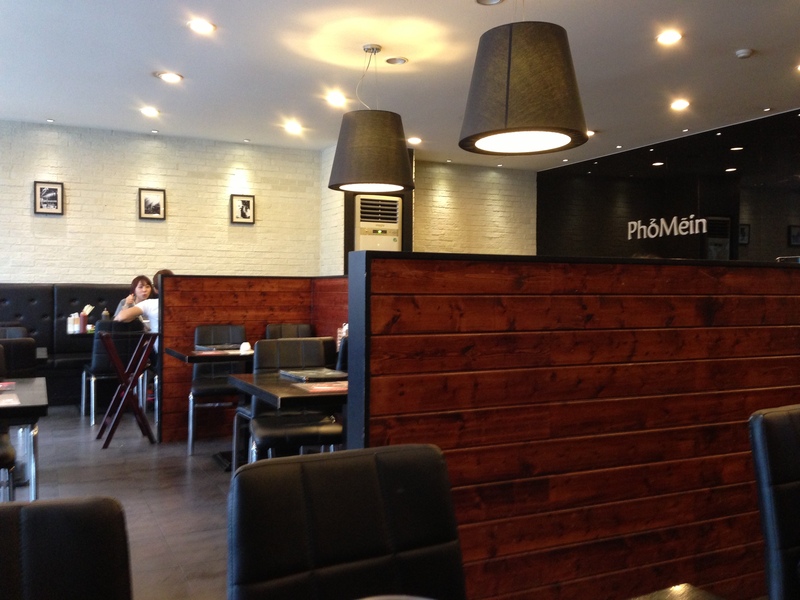 Today I am going to be talking about a restaurant that my Korean coteacher had been raving about for weeks to me that I should try since it had the best Pad Thai and noodle dishes in the world. 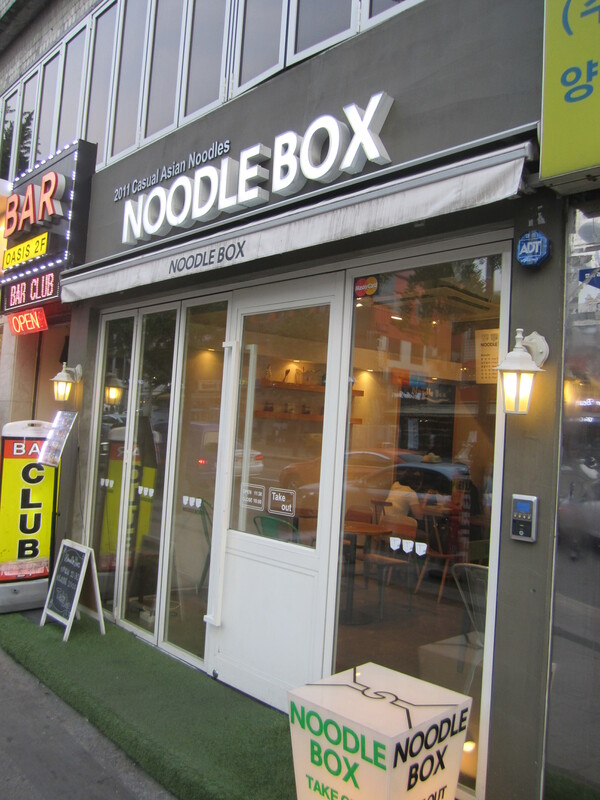 The place in question is called Noodle Box. It’s a chain that can be found in Incheon and Seoul, but I went to the location in Itaewon since I couldn’t find the one in Bupyeong in Seoul. 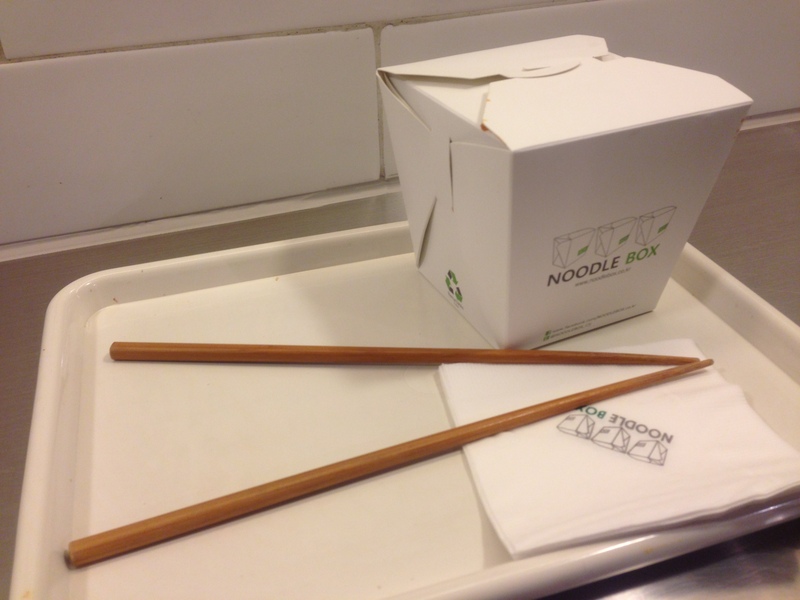 Here is their website: http://www.noodlebox.co.kr/noodlebox/. 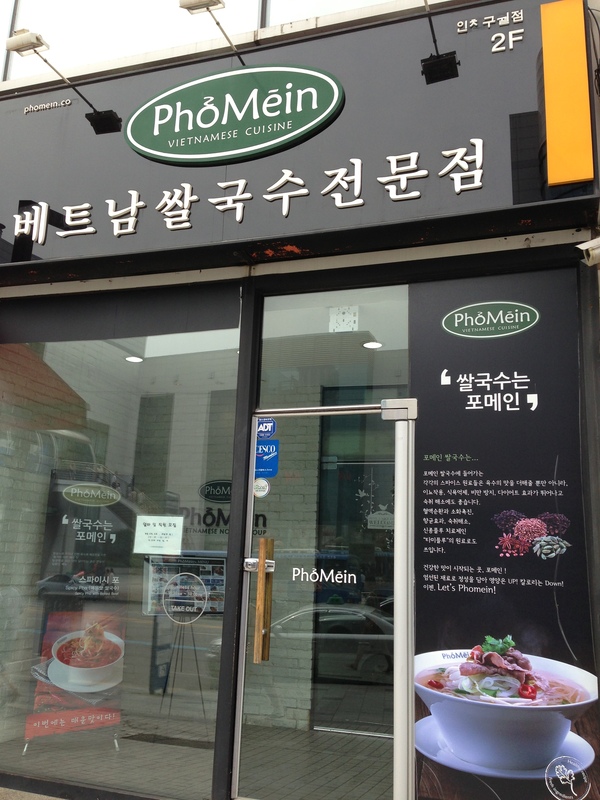 So I found the one in Itaewon quite easily after walking straight out of exit three. I was confronted with a sleek and minimalist exterior. On the inside, it had the same theme with hard wood floors, stainless steel lunch counters, and slate walls. For some reason it reminded me of a fancier version of Chipotle. 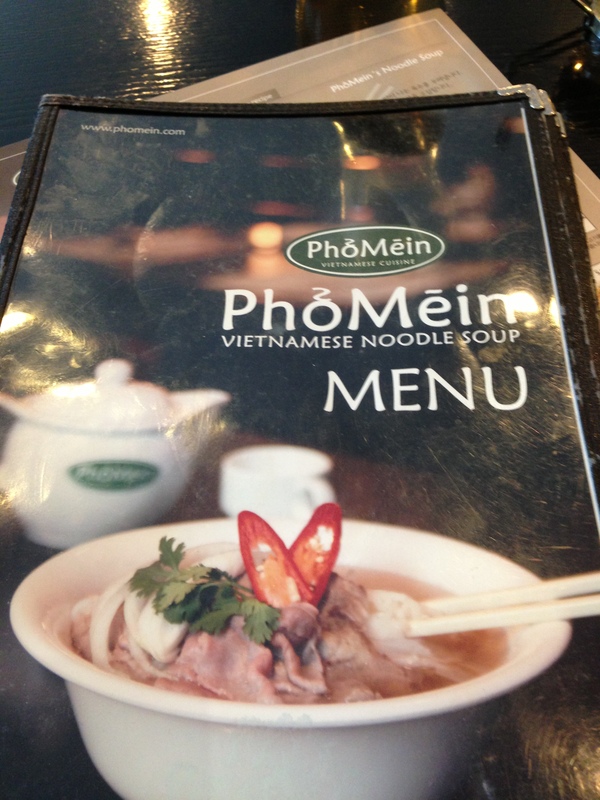 Anyway, I was looking at their menu, and I saw the famous Pad Thai that my coteacher had been yammering for ages about. 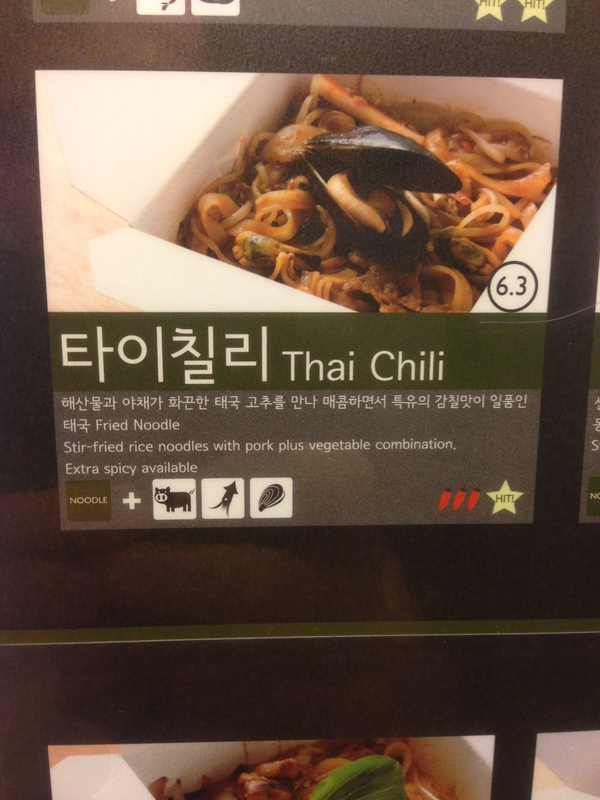 Then again, I want to try something that might be a hidden gem on the menu, so I got the Thai chili noodles (6,300 W). My thirst for adventure was rectified by the end of the meal. After giving my order to the cashier, I helped myself to some free, cold water which I definitely appreciated on a humid day like yesterday. After about 5-7 minutes, I received my meal in a moderate sized box that ended up being jam-packed with flavor. 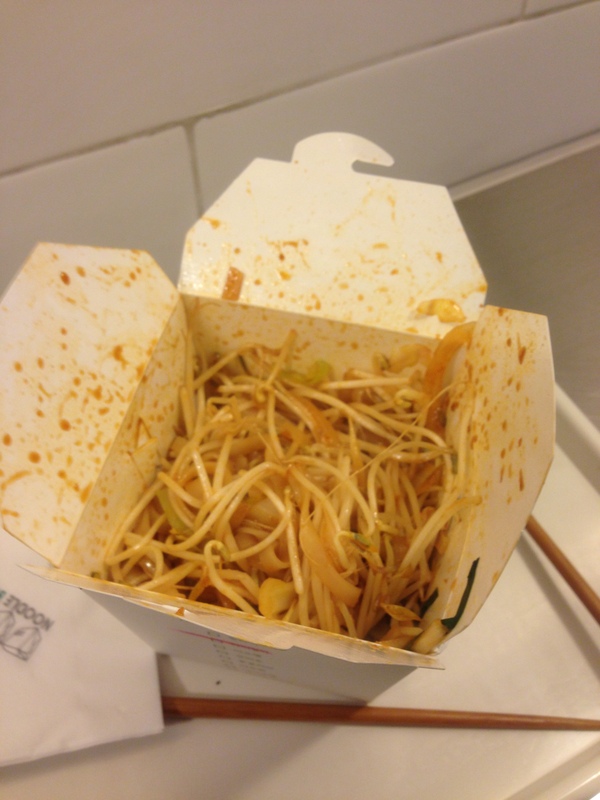 When I first opened it up, I was greeted with a thick layer of bean sprouts. They were fresh and crispy, but I soon dove further beneath this superficial layer of cellulose to find the spicy noodles. There were plenty of flat, stir-fried rice noodles that were bathing in a devilishly red chili sauce. 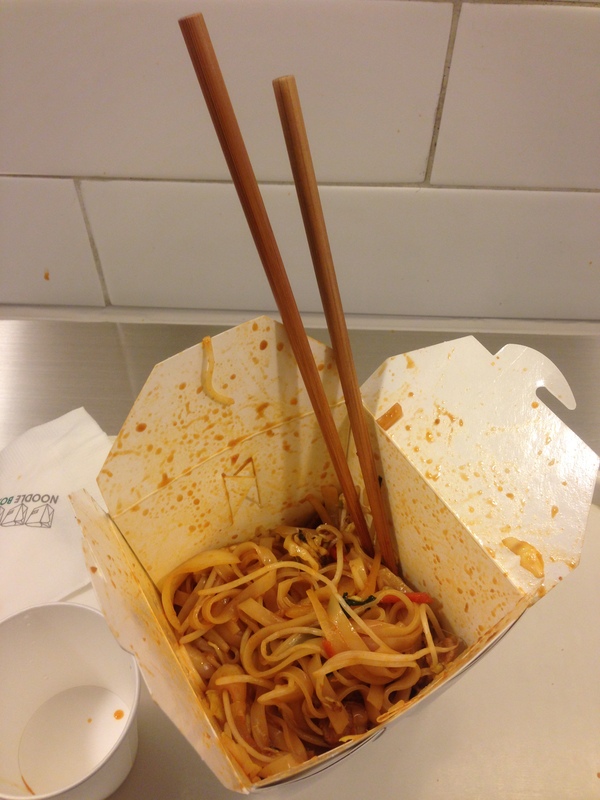 Cultural Note: Even though it’s a great pic, sticking chopsticks in food like this is considered impolite. I knew what I was getting into with the three peppers on the menu, and I was pleasantly surprised at the spice level. I would liken it to a very mild habanero like bite. The sauce itself was not overly sweet, and the individual ingredients that were lurking amongst the noodles intrigued me. Just when I thought it was just bean sprouts and noodles, a couple of mushrooms would poke their chewy caps out of the carb laden forest, or some thin but large pieces of sauteed pork would saunter out to be enjoyed . The pork was juicy and tender, and there were even mussels in the mix sans their signature black shells. 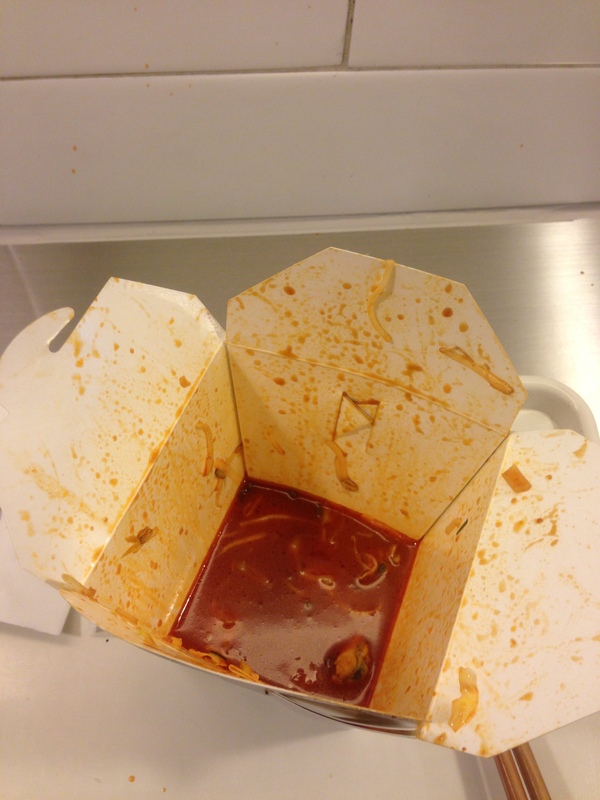 By the time I reached the bottom of the box, I was quite full and satisfied with my blazing noodles. 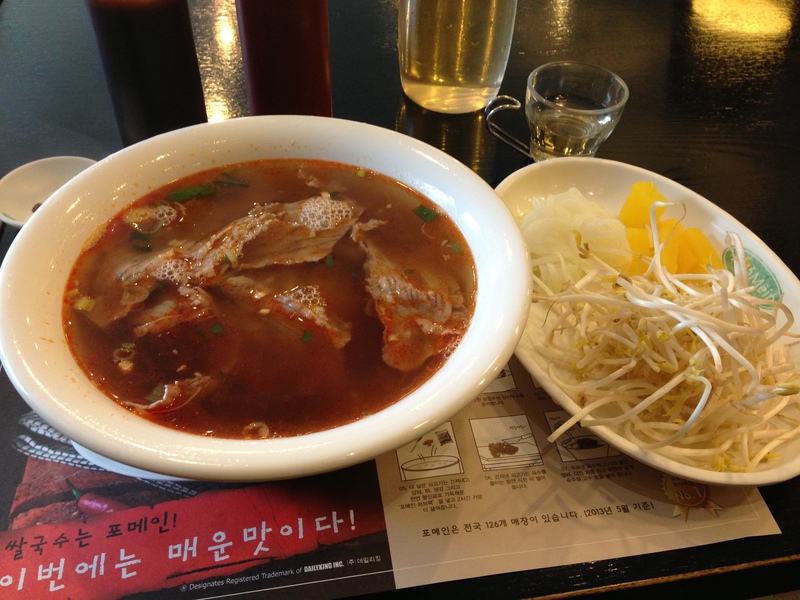 So if you’re looking for a quality restaurant that serves more than just japchae and naengmyeon, head on down to Noodle Box to get a little more flavor to savor. 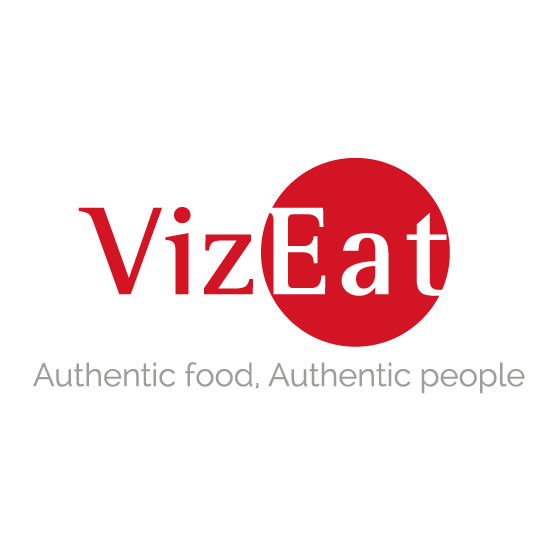 Posted in Chinese, Far East Asian Cuisine, Southeast/Southern Asia Cuisine, Thai, Vietnamese and tagged chili, hot, Korea, noodles, restaurant, Reviews, spicy, Thai. Bookmark the permalink. Hello to everyone and welcome to another scrumptious edition of Mastication Monologues! Today I was kind of a fatty with how many things I tried, but I’m pretty sure that I’ll never eat at this place again since I don’t like to eat a lot of fast food very often. The place I’m talking about is Lotteria. Living in South Korea, it seems that three retail companies run/own everything: Lotte, HomePlus, and E-Mart. When I say own everything, their names are even on residential apartment buildings. Talk about corporate branding run amok but just another little quirk of living in a different place. Anyway, corporate omnipresence aside, I felt the need to try Lotteria since I never heard of it, and it seemed to be Korea’s answer to McDonalds. It looked pretty much the same like any fancy McDonalds, but I saw some interesting options like squid rings and red crab bites However, I don’t even eat Filet O’Fishes back at home, so there was no way I was going to be eating seafood here. 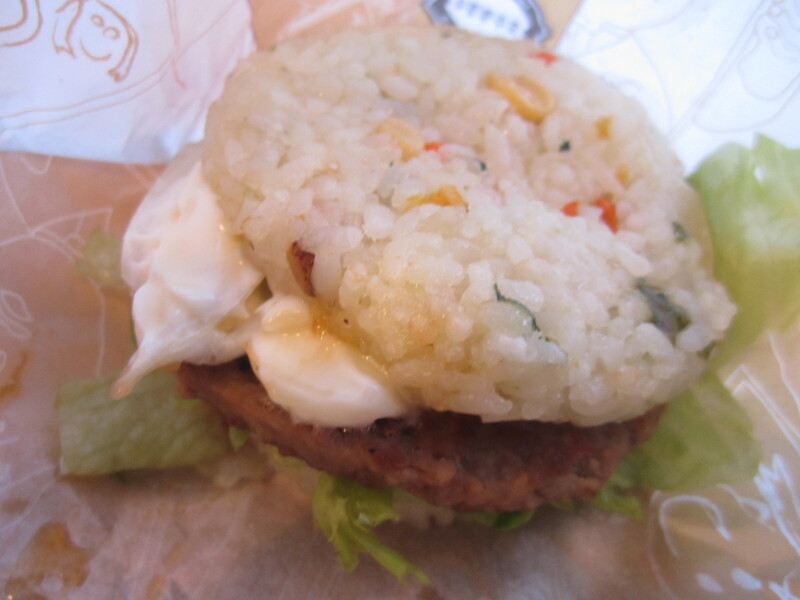 I ended up ordering the vegetable rice bulgogi burger and the shake shake chicken. Oddly, they ended up giving me a Hanwoo Lady burger too for some reason, so I wasn’t going to argue with extra food since I’m pretty sure I’ve lost weight here with all of my radish, seaweed, and fermented cabbage ingestion. 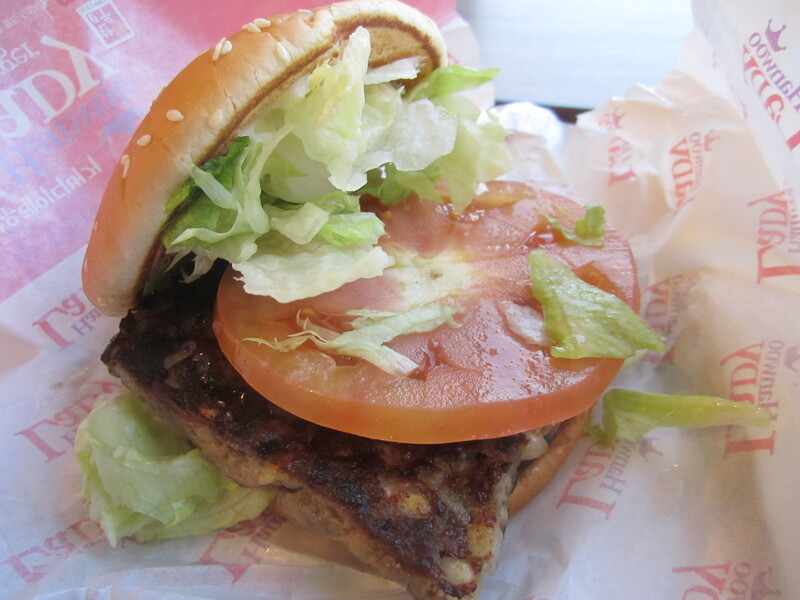 Plus, the burgers are smaller here than in the States, naturally.
. 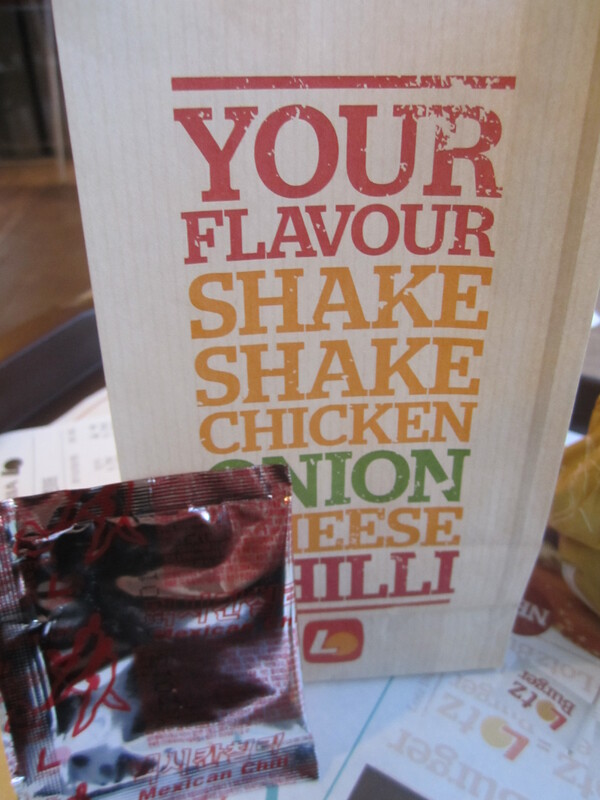 It was basically the Korean fast food version of Shake and Bake. I put the “Mexican chili” powder in the bag and shook away. What I ended up with was small pieces of succulent chicken with what seemed like a cumin based chili powder. I was just glad it wasn’t overly salty like ramen chili powder or Cajun powder they use on Five Guys fries. Overall, I was pleased that I tried Lotteria because it led to me finding a mountain bridge in my neighborhood during a brisk walk after eating. Who says fast food is solely a bad thing? Posted in American Cuisine, Burgers, Chain Restaurants, Far East Asian Cuisine, Fast Food, South Korean and tagged beef, Burger, chicken, chili, dining, Food, grill, hamburger, hot, hot sauce, Korea, mayo, peppers, restaurant, Reviews, rice, Sandwich, sauce, Travel. Bookmark the permalink.